My wife and I had seen outdoor fireplaces and fire pits on image searches while perusing landscape websites and I strongly considered one of these fire structures. I had knowledge of masonry construction but had never built anything large scale. We decided that a fireplace largely outweighed the fire pit idea after discussing our backyard layout. We wanted the larger focal point so the fireplace was our decision. I called several masonry contractors and to my surprise, the costs were a lot more than I thought they would be. The contractors provided quotes for thousands and thousands of dollars and I frankly couldn’t afford that. I subsequently ended up using some of my computer drawing skills to sketch a fireplace. My wife massaged the design a bit…well, actually a lot. In the end, we had a beautifully drawn corner design with interesting angles and cool curves. It had an arched firebox and large side shelves along with a wide stance hearth, which led to a great looking design. A week later were ready to build and we started prepping the space. First, the planter was removed followed by cutting the edge of the flagstone patio off with a diamond blade. I then poured a concrete pad for the fireplace foundation after framing up the footprint of the structure. We then bought the block and mortar needed. Construction started and before we knew it, we had a great looking partial structure in grey form. Mortar stains, pieces of cut block, and the occasional cut finger were all part of the process. We ultimately cleaned up the mortar, collected the block remnant, and applied the Band-Aids. Soon, the naked grey structure was approaching rough build completion. The firebox was lined with firebrick and then wires were routed for the low voltage lighting. My wife found a great veneer from El Dorado Stone and subsequently that was added to the front vertical surfaces. I applied stucco to the sides and back of the structure because cost savings were important. This two-material approach to the outside of the structure definitely made it so the veneer portions of the fireplace became the focus. We painted the stucco with a nice earth tone color that complimented the backyard and grout was added between the veneer stones. 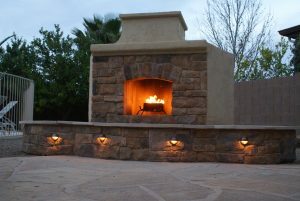 Smooth cut flagstone topped the seating surface and four lights were added to the hearth for that extra nighttime pizzazz. Our first fire was amazing and the fireplace drafted beautifully. Outdoor fireplaces have a certain appeal and calmness about them.lly. We enjoyed the heat with a beverage in one hand and the makings of S’mores in the other. Since then, my family has enjoyed countless nights in front of the fireplace. 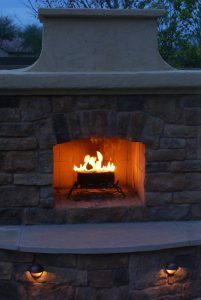 This was a decade ago and the beginning of Backyard Flare, LLC, helping other homeowners in outdoor fireplace design. 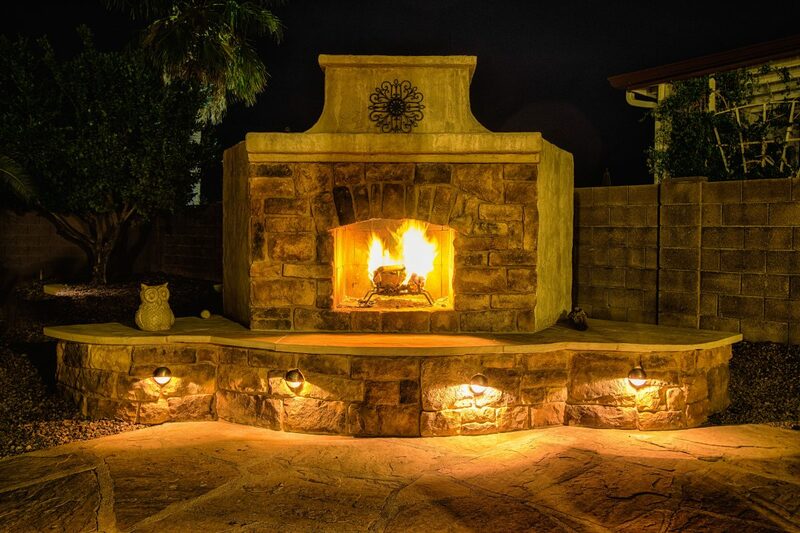 In conclusion, start your planning and design and figure out if a fireplace is right for your outdoor space. It is a great experience. 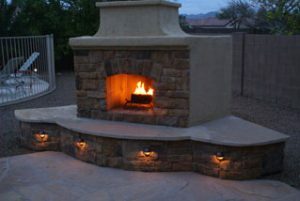 Check out www.backyardflare.com for some great outdoor fireplace design ideas and construction plans that will help you get over the hurdle of figuring it out on your own. Reignbeau, it’s a big box and there are lots of ways to get out of it. I hoped the article helped you.